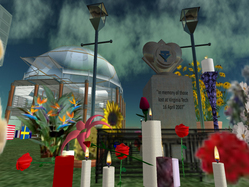 IMAGE: Virginia Tech memorial on Info Island in Second Life. Shrine by Perefim Cao. Most weeks I run coverage of real world-related events and projects in Second Life only on Mondays, but some days, reality refuses to remain confined. And yesterday, most tragically so. Last night there were many shrines and memorials to the innocent victims of Virginia Tech&#39;s savage massacre throughout Second Life, and in the coming days, likely to be more. At the moment, at least one is still ongoing-- sponsored by Info Island (<a href="http://slurl.com/secondlife/Info%20Island/95/111/33/?img=http%3A//nwn.blogs.com/nwn/images/2007/04/17/info_island_memorial.jpg&msg=Virginia%20Tech%20memorial">direct teleport at this link</a>), there is a dispenser where you can take, light, and leave a candle, and be with other Residents from around the world who have also come to grieve. Some leave flowers, or even sculptures in rembrance-- impromptu and sorrowful acts of creativity, converting grief to a more tangible expression that can be shared by all. There is talk of whole regions and estates that will be kept in permanent darkness tonight, the world itself adjusted to suit the occasion, setting a space for candle vigils and other acts of collective mourning. Wagner James Au / nwn.blogs.com, “FOR VIRGINIA (updated),” The April 16 Archive, accessed April 18, 2019, http://www.april16archive.org/items/show/124.